Essential Component #1: Superman’s gotta smile. 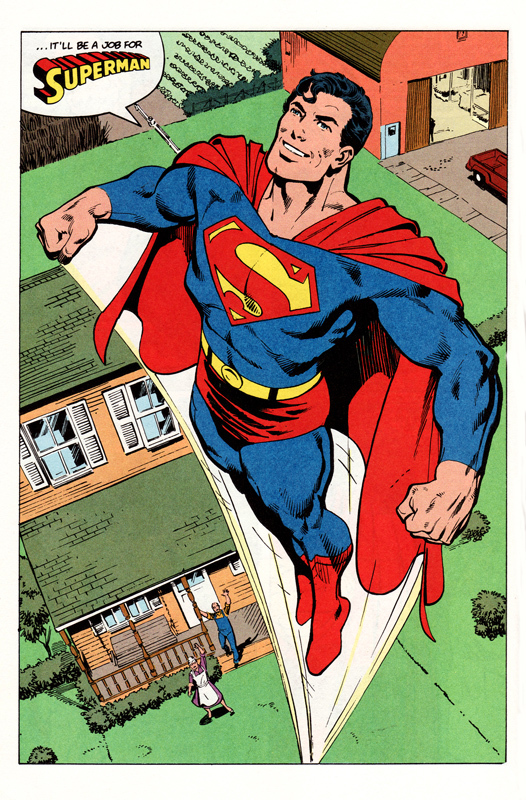 Man of Steel, John Byrne’s 1986 origin reboot, can be criticized as visually dated or narratively disjointed, but nobody will ever say it doesn’t nail down what’s important about Superman. There are two primary points, though, and I think if you strip away everything else, as long as these two elements are in place, you have a workable Superman story. First among them: Superman has to really like being Superman. The best part of Man of Steel comes early on, when young Clark appears in his parents’ kitchen, unannounced and completely shaken. He was in Metropolis – still trying to figure out how best to use his powers to help people – when a space shuttle disaster moved him to act, in public, in broad daylight (a split-second decision, too – no questioning, when lives were at stake). Up until this point, it never quite dawned on Clark how much his life would be over if he continued operating out in the open. It’s a heartbreaking moment, to see a man who only wants to help realize that the cost of that selflessness would be any semblance of a normal life. So when Ma and Pa suggest a costume, a bright blue public figure that could put people at ease – while also taking attention off quiet, mild-mannered Midwesterner Clark Kent – it goes from potentially the worst day of Clark’s life, to the best. With a little bit of creative costume design, Clark Kent realizes he can help everyone, without being devoured by his mission. And that’s why Superman always smiles. He gets to do the thing he wants to do most of all, while removing his everyday self from the equation. “Superman” gets the mission, while “Clark Kent” gets the reward of a normal life. Damn. 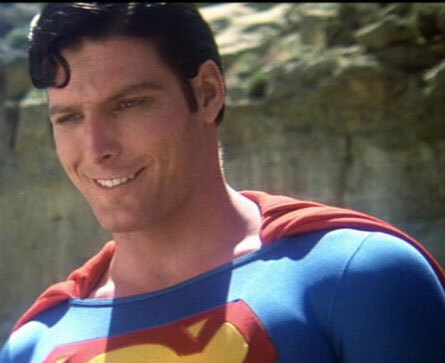 Christopher Reeve looks EXACTLY like Superman. I mean, I don’t think I’ve ever noticed it before, precisely, but what an exactly correct casting choice. …until you remember that DUDE, he got to be SUPERMAN. Right? If you have to be defined by a role — a role, that no one else has successfully managed to pull off since — yeah. SUPERMAN. Just the correct combination of square-jawed heroism and completely open friendliness. Literally, just looking at that picture of him kind of makes me happy. In Brandon Routh’s defense, I will say he did a pretty credible job, even if the movie itself was a disappointment. It’s not really fair to compare him to the Platonic ideal that is Christopher Reeve. Yeah, but he also did a pretty credible job playing Christopher Reeve. But I wasn’t saying it to criticize, necessarily, just pointing it out from an existential perspective — Brandon Routh did a fine job, but the universe beset the film with troubles, because it acknowledges only one Superman. ON THE OTHER HAND! If there’s one thing that bugs me about the recent Geoff Johns/Gary Frank runs on Superman and Secret Origin, it’s that Gary Frank draws Superman/Clark as Christopher Reeve – and as a 2D illustration, Reeve’s face can often look very weird. It’s a bit off-putting and distracting, especially since otherwise Frank’s a really good visual storyteller, and even stranger, I ACTUALLY LIKE WHEN GEOFF JOHNS WRITES SUPERMAN.